A 75-year-old Indian-origin Sikh in the English city of Derby has grown a giant cucumber and says praying to it daily has helped the ribbed vegetable grow to a potential world-record size, British media reported. Raghbir Singh Sanghera, who worked as a farmer in India before coming to the UK in 1991, grew the 129.54 cm (51 inch) cucumber in his greenhouse. Sanghera, a priest at a local Gurdwara and keen gardener, said the cucumber - whose species has not yet been determined - continues to grow in girth and length. The current Guinness World Record for the longest cucumber, which was grown in Wales in 2011, is 42.13 inches (107 cm), the BBC reported. "I have made a seat to sit next to it and where I can see it and watch it," he said. "I pray that it grows, that it keeps us all healthy and that everybody stays well and happy - it makes me happy seeing it." Sanghera feeds the plant with water and fertiliser in the morning, lunchtime and evening, and sits next to it for three hours a day. "I've been growing vegetables all my life but I've never had anything like this. I think the hot weather may have helped it to grow," he said. Sanghera plans to submit the giant cucumber to the Guinness Book of Records when it has stopped growing. He grows Indian vegetables but none have compared to the giant cucumber. Sanghera and his wife Sarbjit, lives in Normanton, Derby, has two children. He said: "Our children and two grandchildren love coming to see it. They are very proud. It is like another child," he was quoted as saying by Derby Telegraph. Peter Glazebrook, an expert in growing giant vegetables, says it appears to be an Armenian cucumber (Cucumis meloflexuosus), making it a muskmelon as opposed to a standard cucumber (Cucumis sativus), which is part of the gourd family. "We have seen these presented before at giant veg shows only to be rejected," Glazebrook was quoted as saying by the BBC. "However, it is a fine specimen of its type, and he has done well." 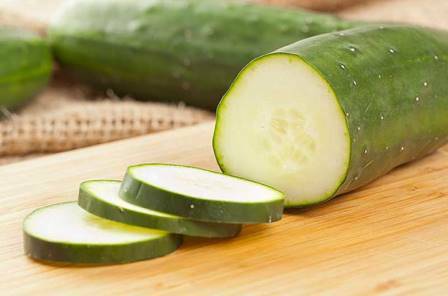 Only members of the Cucumis sativus species can qualify for the Guinness World Record of longest cucumber. A spokesman for Guinness World Records said they have no current record for the longest Armenian cucumber, "but anyone can apply to create a new title via our website".